Whenever you login to your WordPress website, you are taken to your admin area. The first page you see is your admin home page; which displays the WordPress dashboard. The WordPress dashboard area gives you a general overview of your website. It also displays many useful quick links for performing common tasks such as writing a quick draft or replying to the latest comment. The WordPress dashboard is viewed by millions of people every day. The dashboard area is built up of many different widgets. Each widget can be enabled or disabled. To do this, click on the “Screen Options” drop down menu at the top of the page. This will show you a list of default widgets and widgets that have been added by plugins. Simply uncheck the widgets that you want to remove and they will automatically be hidden. Dashboard widgets can be enabled and disabled via the screen options drop down menu. Many beginners do not alter the default dashboard that WordPress initially offers. However, WordPress allows you to minimize widgets. It also allows you to drag widgets to a new location. This lets you place the widgets you use more frequently in a more prominent position. 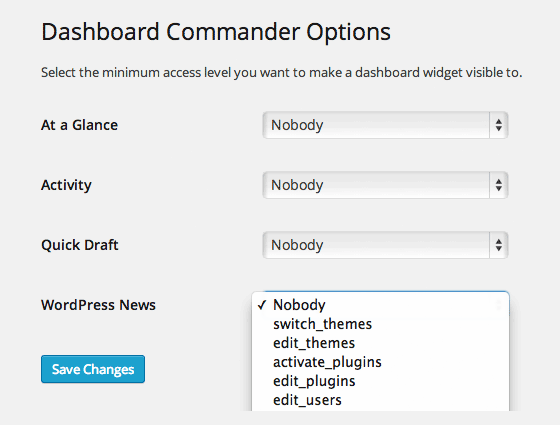 Let us take a closer look at the default widgets that populate the WordPress dashboard. The welcome widget is displayed at the top of the dashboard. On the left hand side is a large “Customize” button that takes you to the WordPress theme customizer and a link underneath to the main themes area. The center column contains useful links to create a blog post, create a page, and view the front end of your website. The “Welcome to WordPress” widget contains a lot of useful links. The last column contains links to the widgets page, menu page and comment settings. A link to the “First Steps With WordPress” page in the WordPress codex is also displayed. Unlike other widgets, there is no option to minimize the “Welcome to WordPress” box. Instead, there is an option to remove it. I assume that this is because the widget is aimed at beginners. You may have dismissed the widget already and removed it from your dashobard, however if you find its quick links useful, you can re-enable the “Welcome to WordPress” box via the screen options drop down menu. The “At a Glance” widget gives you a general overview of your website including the number of published posts and published pages. The figure for the total number of comments include spam comments. The theme you are currently using is also noted and a reminder is printed if you have blocked search engines from indexing your website. The “At a Glance” widget lets you quickly view your website metrics. Some plugins add additional information to this widget. For example, if Akismet is activated, it displays how many spam comments it has protected you from and how many spam comments are queued. The concept of quick draft is simple. If you have an idea for a post, write down a title and some notes about your idea and then save it as a draft. You can then complete the post at a later date. 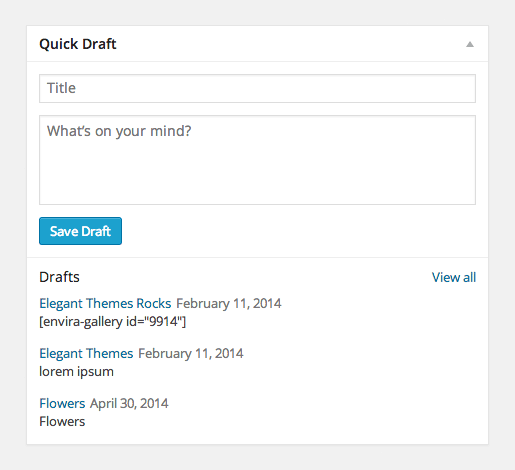 “Quick Draft” is a great way of saving blog post ideas. The “Activity” widget is useful for replying to comments. 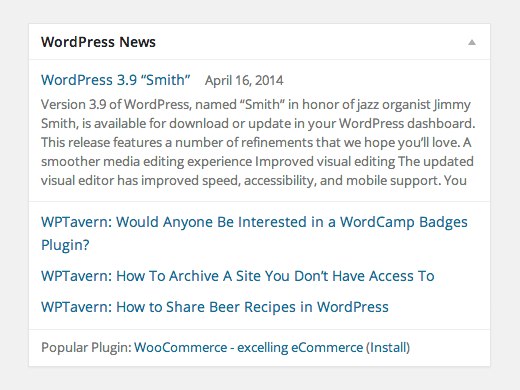 The “WordPress News” widget displays the latest blog posts from official WordPress blogs such as WP Tavern and the WordPress.org blog. In the past, I would check this widget to see if there was any WordPress update. Since WordPress now advises you whenever a new update is live, I tend to hide this widget. The latest news is displayed in the “WordPress News” widget. The WordPress dashboard is not restricted to the five widgets that come packaged with WordPress. Many plugins add a widget to your dashboard after activating it. For example, if you have the WordPress.com Stats module from Jetpack activated, you can see a summary of your traffic stats directly from your dashboard. 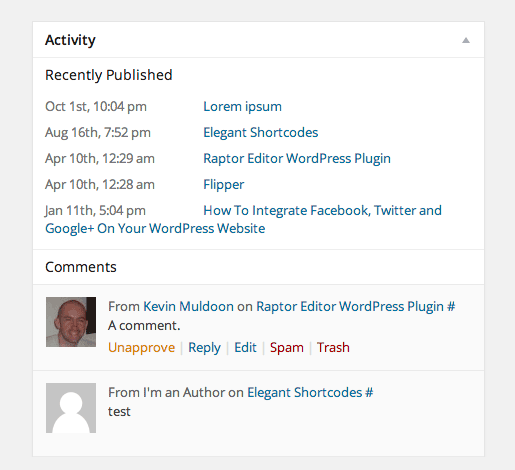 Many plugin developers add widgets to the WordPress dashboard. Other plugins, such as Dashboard Notes or Advanced Drafts & Reviews Dashboard Widget, are specifically designed to enhance your WordPress dashboard. This allows you to truly customize your dashboard with the information you need. For example, on my personal blog I have installed Google Analytics Dashboard for WP so that I can have a quick glance at my recent traffic stats every time I log in. If you have a lot of plugins installed on your website, your dashboard may start getting a little overcrowded. Do not be alarmed if this occurs as you can disable any unwanted widgets through the screen options menu. Alternatively, you could use a plugin such as Nova Dashboard Cleanup to remove unwanted widgets. The default widgets, such as activity and quick draft, are automatically displayed on the dashboard of other users such as contributors and authors. Plugins that add widgets to your dashboard may also show them to unauthorized users. This can be a big problem as users may see sensitive information that they were not supposed to (e.g. traffic, important notes etc). To control what widgets other user groups can see, I recommend using a plugin such as Dashboard Commander. It allows you to restrict access of widgets to users who have a certain permission level. Dashboard Commander allows you to control what users can see and do in the dashboard area. For many people, the WordPress dashboard is simply the page they see before they click on the admin menu and go to a specific page. For others, the dashboard has become a nuisance as it has been filled with useless widgets from plugin developers. Yet, if you take control of your dashboard, it can be a fantastic tool. It can be a place to save ideas, reply to comments, and view your current traffic statistics. WordPress gives you the tools to control your dashboard; however it is your job to use them. Good to know I’m in the clear by by hiding the “WordPress News” widget. My ‘Broken Link Checker’ plugin displays on the homepage and it’s reassurance that all links are working properly. 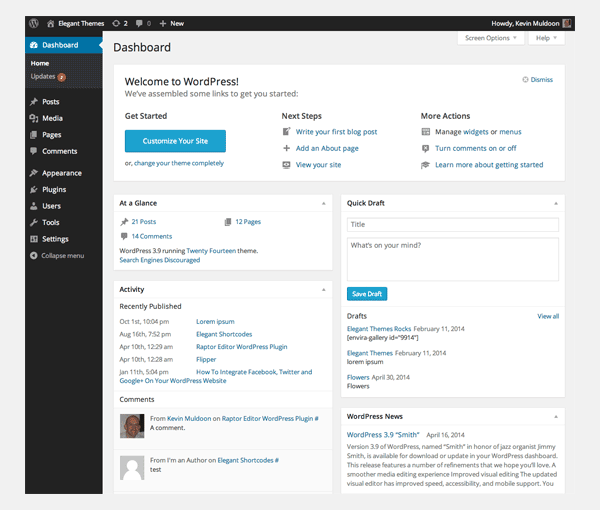 Nice article Brief and complete information about WordPress dashboard for WordPress fresher !!! Rare post but awesome! I think they are all in the WP books except the plugins to control the admin area. Thanks Kevin for tipping us to take charge of the Dashboard. Cheers. Thanks much ! I just wish this was a pdf so I could keep it as a reference! I am sometimes confused about wordpress explain to my clients, such as on the dashboard navigation teradapat. Thanks for sharing. I’m a WP beginner this was really helpful. A good guide for WordPress’s beginner, but i think there are more features you can manage on admin doashbard. Anw, good job to you! Sometimes it’s easy to help folks by going back to the basics. Good post, Kevin! My dashboard/menu does not look anything like this.